Proxyclick is more than a tool to help you welcome your visitors. It also helps you get notified whenever an unwanted visitor shows up: by sending out an alert so that your team can react accordingly. Visitor management has two sides - on one hand, you want your guests to have a great experience and everyone to feel welcome, but on the other hand, you want to keep out questionable/unwanted visitors out - or at the very least be alerted of their presence. Are all business visitors created equal? Simply put - no. There’s a number of cases where they have no business (no pun intended) showing up at your office, threatening the security of your operations. Whether the threat is external or internal, you ought to be prepared in order to avoid any unwanted events or incidents. 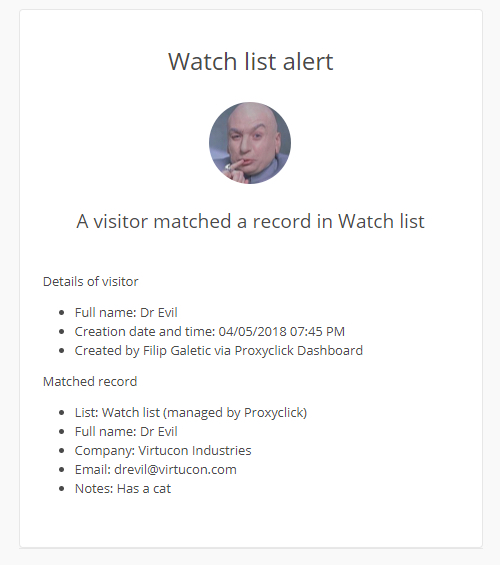 When Dr Evil tries to enter your building..
A Proxyclick Watch list allows you to alert anyone you choose in your organization (typically the security) as soon as the unwanted guest tries to sign in. This alert immediately lets the designated person know that there is a slight issue with the visitor so they can react promptly. This could be a member of the front desk staff, security or whoever you choose. No matter who it is, they will get a timely alert that allows them to handle the situation as required. All this without the need to send emails back and forth, frantic attempts to call a critical member of staff to no avail, stressful double checking the person against the blacklist manually. It’s fast, accurate and streamlined and helps you avoid disrupting your workplace because of a flagged visitor. The chosen colleague will receive an alert via email and if desired, via SMS/text message as well. What info do you need to enter into the Watch list? In each Watch list you create, you only need to enter the first and last name of the watched individual. This is critical for matching upon check-in. You can also include additional info such as the company name, email, custom notes and even upload the picture of the persona non grata. When it comes to securing your premises with the help of our Watch list, your visitor won’t notice anything at the moment of signing in. They will never be aware an alert was triggered, meaning the delicacy of the situation will always be respected and up to the person receiving the alert. We never “block” users from entering, instead leaving that prerogative to our users. 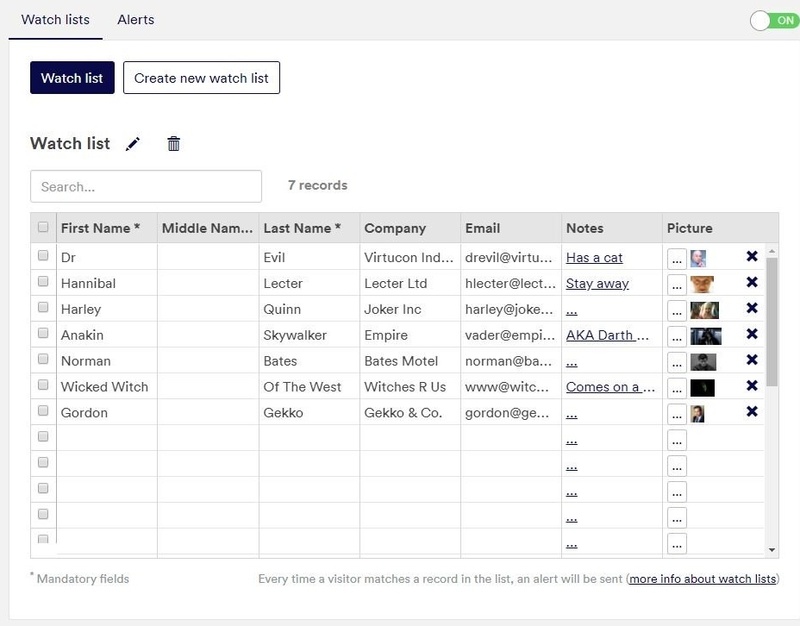 Additionally, in the Dashboard you can create and name as many Watch lists as you’d like. That way you can “theme” each to a specific purpose. For example, you might want to have a list of people that pose an ‘immediate threat’, but keep others less volatile on a ‘to be watched’ list. This level of customization was important for us to implement as no two visitors are the same - even among the unwanted ones. In fact, you’re not limited to using Watch lists simply for unwanted visitors. You can also create a so-called White list to single out the Very Very Important Persons from the rest. This is very useful in the event you want to provide them a very, very special welcome. We also built in flexibility into how the Watch lists are managed across multiple locations. In fact, multiple locations are another reason we offer multiple Watch lists. That way you can have different Watch lists for different buildings in different locations. The flexibility doesn’t stop there, however. If you have multiple building in multiple locations, you can use the Watch list of another location simply by choosing it from a list of available Watch lists. No need to duplicate your Watch list in each location. Should you so desire, you can also link Watch lists to the lists provided by a third party. To learn more about these options or to find out how alerts work and how the visitor data is matched against the Watch list record —or simply to learn how to set up a Watch list— consult our help article or just contact us.